Our region’s marine environment is within the GBR World Heritage Area, the world’s largest and most complex reef system. Our region’s near-shore reefs include fringing reefs such as those around the Palm Islands, and Magnetic Island. Near-shore reefs have close connections with coastal habitats (such as mangroves and wetlands), and are exposed to greater impacts from coastal and catchment activities than the outer reefs in the adjacent Oceans NRM regional area. Our region’s reefs are centrally located among the 3,000 coral reefs stretching 2,300 kilometres along the Queensland coast. Reefs create critical habitat for countless marine organisms, and also provide essential ecological processes. The reef is a centre of species richness and endemism and its structure buffers the coast from waves and storms, its organisms support commercial fisheries and tourism, and it is strongly linked to Indigenous and broader Australian cultural identity. 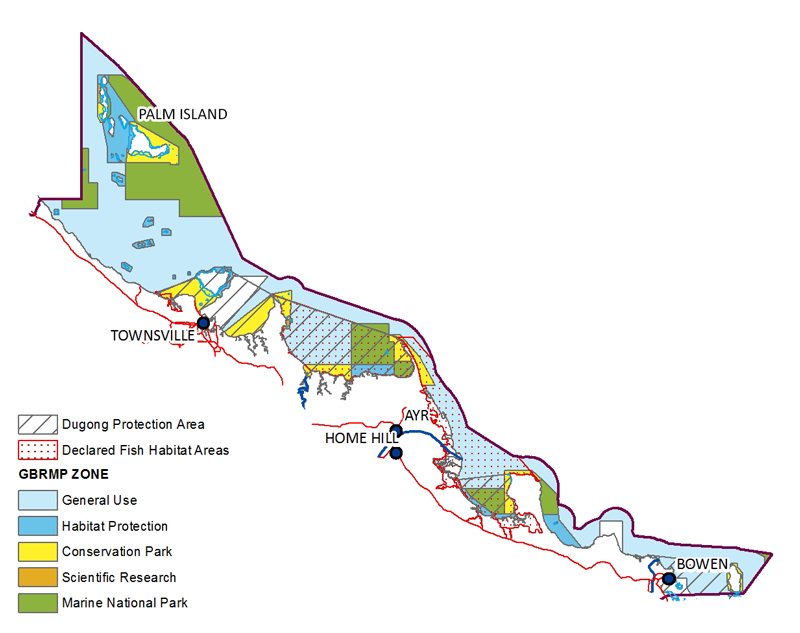 The coastal bays of the World Heritage Area provide significant habitat for many iconic marine species and are covered by four declared Fish Habitat Areas (Bohle River, Cleveland Bay, Bowling Green Bay and Burdekin) and four Dugong Protection Areas (Cleveland Bay, Bowling Green Bay, Upstart Bay and Edgecumbe Bay) (see Figure 17). The coastal waters within our region include seagrass-dominated, shallow marine environments of the GBR Lagoon and provide important fish habitat and nursery areas. The meadows are frequented by dugongs and turtles as witnessed by feeding trails and scars. These meadows are also visited regularly by recreational and commercial fishers. Sediments within this habitat are mud and sand that have been discharged into the marine environment in flood plumes following large storm events, in particular from the Burdekin River. As mentioned in previous sections of the plan, major pressures and threats, particularly to Burdekin wetlands, coasts and marine assets, include pollutants (sediment, nutrients and pesticides), altered hydrology and loss of seasonality, coastal development, marine traffic and climate change (Great Barrier Reef Marine Park Authority, 2013).